I found this great vintage joystick at a surplus store and decided I needed it for my synth. It is a massive joystick with a side control and light and four adjustments on the bottom for offset and gain. 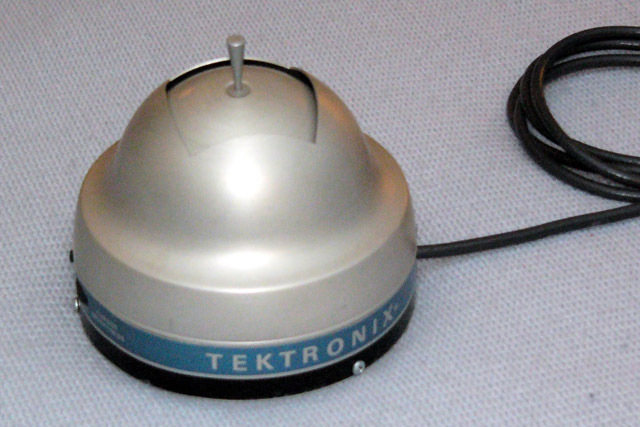 It is a Tektronix 4951 Joystick and was an option for the T-4002 Graphic Computer Terminal. 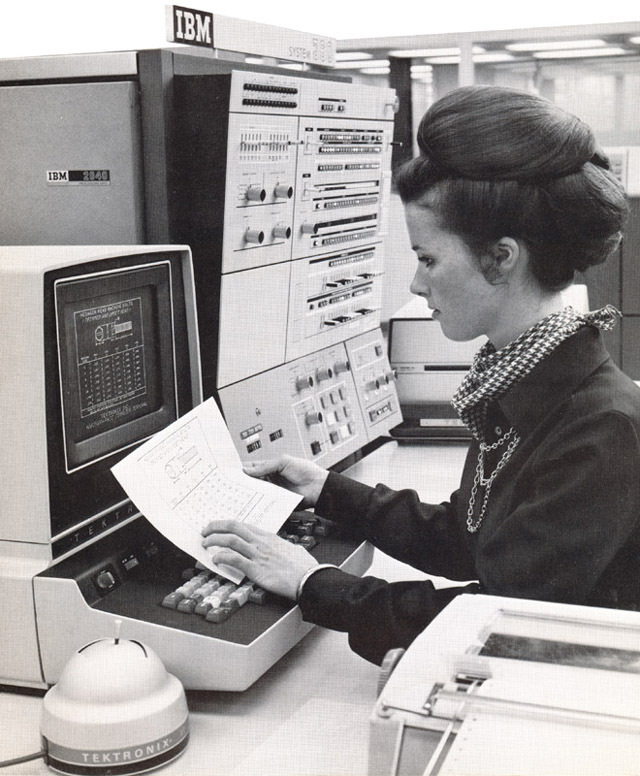 I would estimate that it was probably designed 1968 ~ 1969. 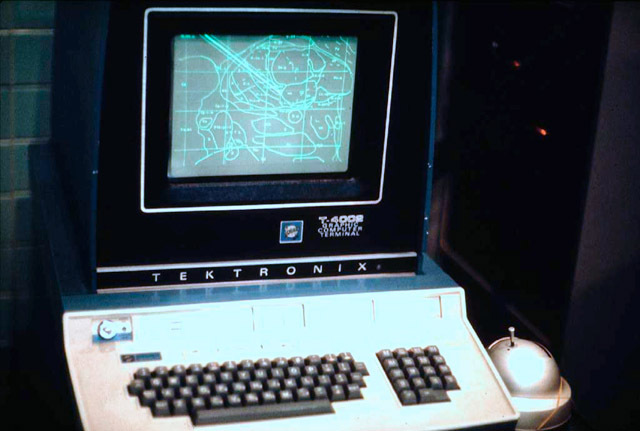 I found this photo on the internet of a Tektronix T-4002 Graphic Computer Terminal with a 4951 Joystick. It looks like they tied the joystick to the table! 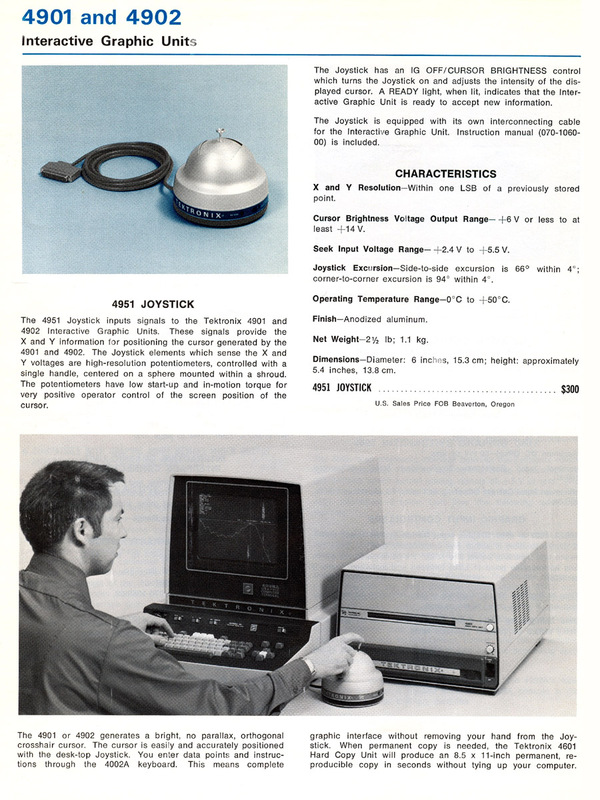 Here is a 1971 Tektronix advertisement of a T-4002 Graphic Computer Terminal with a 4951 Joystick interfaced to an IBM 360 computer. I designed a 1U joystick interface with 0 to 10 and +/- 5 volt outputs. The joystick is so large that there is no convenient location for a gate switch so I added a gate and trigger switch to the panel. I used an ATTINY13 to debounce the switches and generate a 5 mS trigger pulse. There was very little room inside the joystick to add the op amp PCB. The housing reduces the overall travel of the joystick so I used the gain and offset controls to fine tune the joystick when assembled. I used the switch on the cursor thumbwheel to disable the offset adjustment so I can adjust the gain control for a 10 volt range. 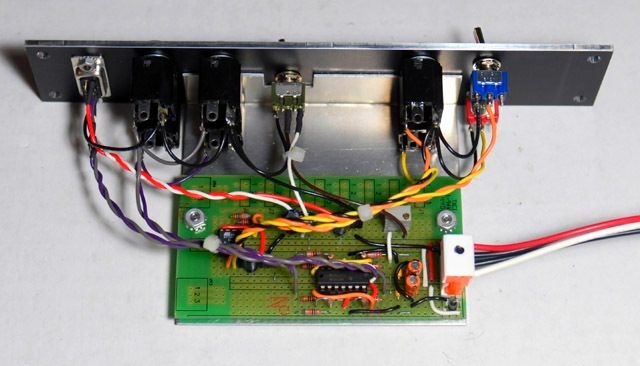 The offset control is then used to set the zero voltage level. I replaced the light with a 5 mm red LED. I used a scrap portion of a MOTM-000 prototype PCB to build the module and a custom aluminum bracket to mount it to the two jacks.